AP ICET 2019 Apply Online link activated on 27th February. APSCHE board issued the APICET 2019 Notification on 20/02 for the candidates who have aimed for being Post Graduation in MBA/ MCA Courses. Interested and eligible candidates must complete the AP ICET Online Application Process on or before 27th March 2019. If you failed to submit the sche.ap.gov.in ICET Online Application before the last date, then you can submit after that with a late fee. Candidates can go below to verify the Andhra Pradesh Online ICET Application Process 2019, Eligibility Criteria, Exam Dates, etc. Latest: AP ICET Online Application Form Started. Candidates can Apply from 27th Feb to 27th March 2019. 1.3 How to Apply for Andhra Pradesh ICET 2019 Exam? Andhra Pradesh Integrated Common Entrance Test applying procedure is given here. Aspirants have to submit the Online Application for APICET from 27/02 to 27/03/2019. Candidates have to pay application fee Rs 550/- for the APICET Exam. Aspirants can also submit the Online APICET Applications upto 4th April 2019 with a late fee. Candidates firstly know the complete Andhra Pradesh Online ICET Application Procedure before proceeding to avoid mistakes. Applicants who are interested in AP ICET Exam 2019 can apply Online. Here we have provided detailed information about four steps of AP ICET Online Application process that is Fee Payment, Payment Status, Fill Application Form, Print Application Form. Aspirants have to complete the four steps while applying for APICET Notification 2019. Those four AP ICET Applications Online Steps are Fee Payment, Payment Status, Fill Application Form, Print Application Form. We have provided detailed information about each APICET Application Steps. We have also mentioned the direct links for all AP ICET Online Steps. So, willing candidates refer to the procedure and then complete the Andhra Pradesh ICET Application Process before the last date. 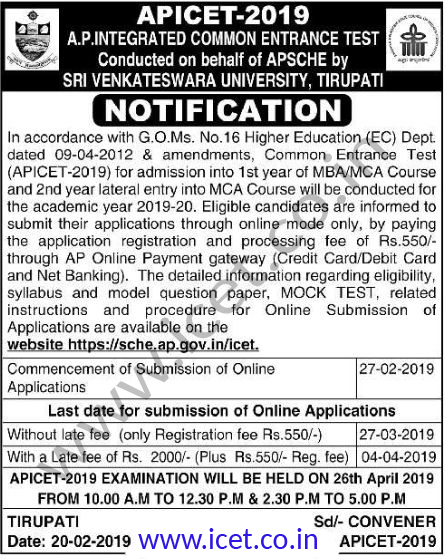 AP ICET Exam 2019 is going to conduct by the Sri Venkateswara University, Tirupati. This State Level Exam is mainly conducted for providing admissions to various Technical & Management Colleges located in Andhra Pradesh. Every year the AP Government conducts various Common Entrance Examinations for different courses. AP Govt will be announced AP ICET 2019 Exam notification in the month of February/ March 2019 for the candidates who are pursuing or graduated in Bachelors Degree. Students who are interested in joining Post Graduation in AP State can grab this chance and apply Online. The Announcement is an excellent opportunity to the candidates who are dreaming to study in Best PG Colleges. The Aspirants who are interested in applying can fill AP ICET 2019 Application Form before the due date as soon as notification released. Registration Starts From 27th February 2019. Last Date for AP ICET 2019 Apply Online Process 27th March 2019. Last date for Corrections in application 5th to 14th April 2019. How to Apply for Andhra Pradesh ICET 2019 Exam? We will maker your AP Online ICET Application Submission very easy by providing the overall process and direct links. 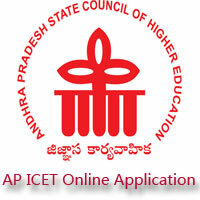 Aspirants can check the Andhra Pradesh ICET Application Steps here. Candidates can also complete their all AP ICET 2019 Online Application Steps here. Firstly, candidates can also follow the below steps to redirect for Andhra Pradesh ICET Application Steps. Then click on the AP ICET Bar. The On displayedCET Steps are displayed on the screen like below figure. Candidates must complete all steps. AP ICET Application Fill Up. Candidates who are preparing for the ICET 2019 Exam should know the online application process to apply. The AP ICET Online Application 2019 Process includes the above steps. AP Government inviting applications from the candidates who are interested in becoming Post Graduates in Technical and Management Courses. Students who have completed their Degree Examination or pursuing the degree can apply this ICET 2019 Exam. Based on ICET Score/ ICET Rank they will get the admissions in various colleges. Online AP ICET Application & payment of fee details are briefly given below. The first step in Andhra Pradesh ICET Application process is Fee Payment or below link. For that, click on the “fee payment” in APICET Steps. Enter all details such are qualifying exam hall ticket number, candidates name, date of birth, mobile number, valid email id. After entering all the details click on “Initiate Payment”. Save the Reference ID Number. The other alternative to do APICET Fee Payment is through APOnline. Give the details of qualifying exam hall ticket number, candidates name, father’s name, mobile number, and pay the fee. Candidates have to pay the APICET Application Fee of Rs. 550/- through Online mode such as APOnline/Debit/Net Banking/Credit Card. The process of fee payment differs according to the method of payment they have chosen. Once you have paid the fee then through the registration Id you can submit AP ICET Online Application to the board. ICET Application Fee is same for all the students. The candidates who are unable to submit the ICET application on or before the due date, they should pay the application fee along with the late fee. The late fee details are given in below sections. Candidates can pay the AP ICET Application fee through Debit Card/ Credit Card/ Net Banking at the time of filling the Application Form. This is the second step of Andhra Pradesh Online ICET Application Process. After the completion of AP ICET Application Fee, you may also check the confirmation status. For that follow the below steps. Click on “Know Your Fee Payment Status” on APICET Steps Page or below link. Enter the Qualifying Examination Hall Ticket No and Mobile Number. Then click on “Check Payment Status”. The Andhra Pradesh ICET Fee Status was displayed on the screen. Afer the successful completion of Fee Payment, candidates have to proceed for AP ICET Online Application fill up. The process to fill the AP ICET Application is as follows. Initially, click on the “Fill Application” or below link. Enter the Payment Reference ID, Qualifying Examination Hall Ticket No, Mobile Number, Date of Birth details. Make sure with all details on click on proceed to fill application. Enter the all details like educational qualifications, Aadhar No, and other details. Scan the recent photograph, and signature. Make sure with all the details. Finally, click on the submit. The final step of AP ICET Application process is taking a printout of AP ICET Online Application. For that, candidates can follow the below steps. Finally, click on Get Application Details. Make the possible hard copies of AP ICET Online Applications for further use. Everyone makes mistakes commonly. Similarly, you may make some mistakes while filling AP ICET Online Application form. So, the SCHE Andhra Pradesh has given a chance to rectify your mistakes and allow you to make corrections in the submitted AP ICET Application form 2019. Firstly, check your options which you kept wrong and verify the type of mistake and category to which it belongs too. The two categories: 1 & 2 are listed out here. Therefore you can make corrections in the submitted Andhra Pradesh ICET Application form from April 2019. These issues can’t be changed by the candidate directly but request along with the verified documents would be accepted. Send request to the Convenor AP ICET 2019. Medium of instruction in qualifying exam. SSC Hall Ticket number & year of passing. NOTE: Therefore the Corrections related to CATEGORY 2 in the submitted application should be done by the applicants from April 2019. Therefore, we have also provided important AP ICET Links for your sake. So, click on them and refer the complete data. this is hari krishna from vijayawada, i paid a fees of ₹507 regarding ap icet-2017examination, but i forgotten to fill the application today i am seeing that it shows late fees has to be paid, i am ready to pay late fee payment but there is no option to pay like that, can you resolve my problem sir. Sir, my parents income has been updated. Wrongly, I applied this ap icet form on 11/04/17, how to correct it sir? Can u pls help me with this and what are the documents to be submitted to correct? Hi, I paid late fee but i forgot to submit application and i am going to pay late fee agian but the link showing your mobile number is already registered please let me know process because tommorow is the last date. i registerd and paid online , but i have not got halli ticket. can some one help? Sir, My mother name is wrongly entered in application please tell me how to correct it? Sir i got 2356 rank can i get seat in svu,sk,jntu.If seat was alloted in any university ,what will be the fee structure? I paid fees I want to do correction in my given detail in form some incorrect mistaken. This is Chand. How are you ? If you dont mine. I want to know some information about registration. At the starting Fee payment tab. It shows the fields to fill in that I didnt understand about the starting field i.e., “””Qualifying Exam Hall Ticket Number * :”””. means which number I want to fill in that field. Can you please Help me to get out of this doubt. Sir..please suggest me..regarding how to make changes in the information after payment of fee..??? I gave my SSC hall ticket number instead of Degree Hall Ticket number as qualifying number. please suggest me..to make corrections. This is Chand. I am interested to apply for APICET-2018. But I didn’t understand that about in registration process i.e., “Qualifying exam hall ticket number”. I am fresher I don’t know about hall ticket number/Registration. Can u please say the answers for the above doubts. I MISSED MY APPLICATION FORM OF ICET…can u please say me how to take my new application>??? Sri I want to correct candidates name in application form how can I.
I APPLIED AP ICET 2018. MY QUALIFYING HALLTICKET NUMBER WAS TYPED WRONGLY.MY QUALIFYING HALLTICKET NUBER IS ’14P25B0048′ BUT IT WAS TYPED ’14P25BB0048′,HOW TO CORRECT IT,PLEASE TELL ME.